Karpet Kingdom are delighted to reveal that we can now offer a stunning range of Artificial Grass – with different characteristics to suit your every need. Whether you want an exquisitely green garden, a safe play area for the kids or a rooftop design, we can offer you a high quality, durable lawn, which will look incredible all year round. Artificial grass, has endless bets, to embrace the seasons and last the years. Here are some of the reasons you should go artificial in time for summer…. If you have an artificial lawn, you simply need to brush it every few weeks to keep the pile on top form. There’s no need to mow the lawn, water it, use chemicals or pesticides or even weed it, which is perfect if you’re regularly away from home for work or holiday. Ditch your lawnmower and wave goodbye to the second most hated chore in the UK – shortly behind ironing! It can be difficult to get the garden of your dreams if you’re using natural grass. It can be difficult to grow and can take some time to achieve your desired lawn. With artificial grass, you call the shots. 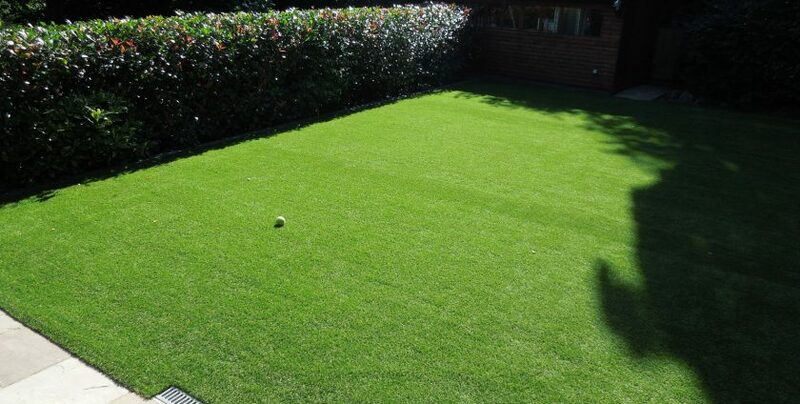 Artificial grass can be cut to fit any shape or size, meaning you can create a bespoke lawn, to suit you. You can easily cut artificial grass to fit paths, ponds, and play and seating areas. Yes there’s the initial investment in buying artificial grass but in the long term, it works out as a cost-effective solution. Artificial grass is durable and eradicates the maintenance costs associated with natural grass, such as paying for moss treatment and pesticides. When you install artificial grass, the risk of playing out in the garden is drastically reduced as during installation, soft foam pads are inserted underneath the grass, to cushion any blows from falling over or slipping off a garden swing. Both your beloved dogs and cats will love artificial grass, as it’s soft on their paws. Whilst your four-legged friends won’t be particularly bothered themselves, artificial grass is a lot easier to clean than natural grass. Artificial grass has a perforated backing so urine flows through it. Solid waste is effortless to pick up and far easier than clearing up from a natural lawn.